Depending upon your areas water supply and how hard your water is, this may be as often as once per month. Limescale prevents and hinders the ability of your kettle to boil water quickly and efficiently. 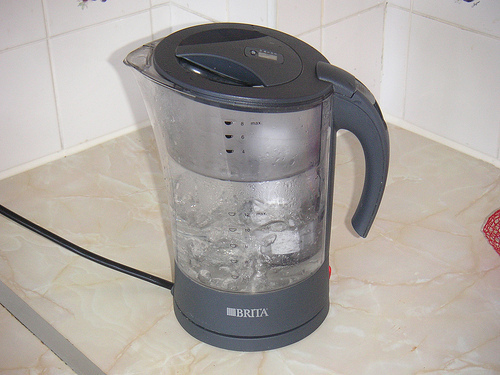 If you can get rid of the limescale in your kettle the electricity will be used to make you a nice hot drink instead of fighting through limescale. There are a number of commercially available products which can be used to get rid of the limescale in your kettle. However, we have a cheaper and more environmental friendly way to do the same job. Of course, you must always check details of your individual kettle to make sure it is suitable. Leave to soak ideally overnight and let the vinegar and water do its magic. You may wish to give the kettle element (if accessible) a light brush possibly with an old toothbrush to remove any extra limscale deposits which are not shifting. Rinse the kettle with cold water a few times and make sure you put the water to good use, don’t simply pour it down the drain. Fill the kettle to maximum level with clean water and carry out a boiling rinse. Now you are ready to enjoy a cup of your favourite hot drink, cup of tea for me please.